Vagamundo offers you the nicest experience in accommodation services for backpackers. Located in the surroundings of central park and close to the best bars in town, we offer a variety of accommodation options to adjust to your budget; you can stay in our dorm or one of our private rooms for a better experience. Vagamundo has a lot of options to make your staying more pleasant and relaxed. We have our own travel agency with Ca Travelers. You can book a nice planned tour across the country or just a nice trip to the highlights of the city. For more information, please contact the property. We have a nice bar with cheap and affordable drinks and our Chef will melt your heart with his culinary skills. 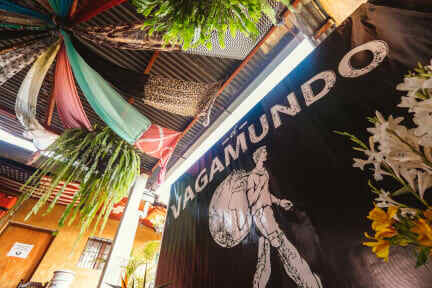 You will find at Vagamundo an onsite Pub, Pool table, Beer pong and also video games. We also have a nice deck with pool so you can swim or just take the sun. We are close to central park and also close to the local attractions such as the ruins and the most iconic churches in town; we are 6 blocks away from the local market and the main bus terminal. You will find the local museums in less than a mile away. You will find private and semi-private rooms besides of our dorms. We offer a wide range of rooms with 2, 4, 6 beds rooms. The rooms have Wi-Fi access and hot showers. Perfect for a comfortable stay in Antigua. Check-in time starts at 12:30 am. Stumbled upon Vagamundo after trying 4 other hostels in Antigua and this was by far our favorite - plus it was the cheapest & a private room! It’s basic but the staff is the best, super welcoming to all and willing to help you find anything you need. The whole place has a very artsy vibe and the bar hosts live music some nights, it’s close to the market, several nice coffee shops & a delicious late night munchie place next door, and the deck/pool is great. adequate party hostel. positive- if you want to have a party, cool place. areas of improvement- lockers outside your dorm room and the outlet in the room don't work well. But the lockers outside you can charge your phone. Kitchen is VERY basic. 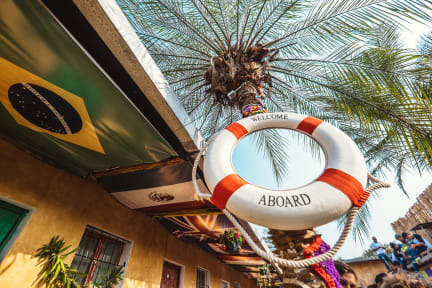 A cool hostel with a bar open to locals. When the bar was open in the evening, bathrooms got a little messy, but were spotless come morning. Definitely a party hostel! Only concern, dorm rooms didn’t lock, but the rooms had lockers. A good spot to stay. Very good location and very nice staff in the CA-travelers desk. The people volunteering in the place were smoking a lot of weed all the time, and the smell was all over the place! Not nice! But the breakfast is very good and the place overall fine. Especially if you like party. If you know what you are getting in to, this hostel is value for money. It was the cheapest place in town but it is easy to see why. In the evening the place turns in to a bar open to everyone with very loud music! Luckily the bar closes 11ish. We spent two nights there and the mornings was my favorite time. The place has a really friendly chef who makes great breakfast for free and a nice “patio” where you can eat, catch some sun or take a dip in the tiny pool. There needs to be a massive change in the way this hostel is officially advertised. The hostel themselves need to express that this is a party hostel with VERY loud music and visitors/guests/workers that will rage on all night, no matter what night. No soap in the hand soap, no mirror in the private bathroom, bugs all over the room and the towel given reeked of urine. Couldn’t sleep all night due to the noise and ended up with dozens of bug bites all over my body. Cheap but pretty awful.